The ChaCha-bike (short for Charming Chair-bike). This bike was the origin of all FlevoBikes. 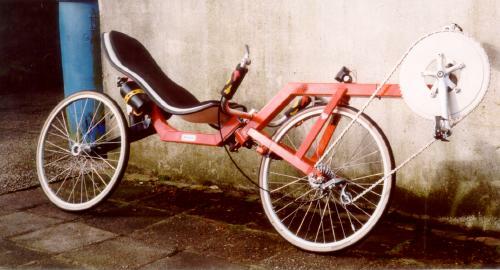 This is one of the very first Flevo-Bikes, and can be seen as a 'collector's item'. It was probably built in 1987 at the school where Johan Vrielink was a steel construction teacher, before he started his FlevoBike factory. It was an end-of study examination project: Many parts of the bike had to be built by the students themselves, according to the construction paper. For example: The rear hub was hand made on a lathe, and the rear 'fork' was single armed. The suspension was taken from mopeds. This bike is now the proud property of Fokke Buwalda, who describes its restauration on his own website. 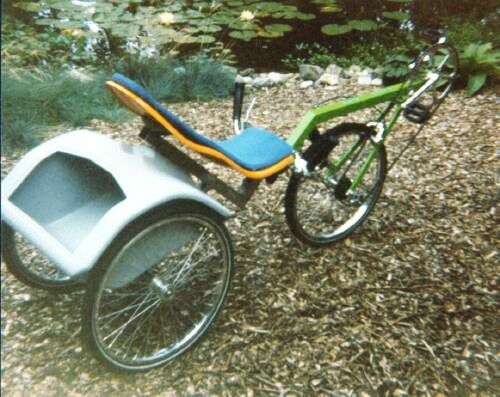 On this picture you see the very first trike prototype. 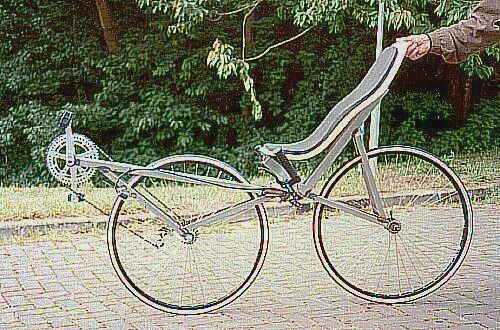 It was made from a modified Bike-frame and had no Duschar®-System yet, i.e. no tilting mechanism. Tests with this vehicle showed that it is a bad ride on a non-tilting trike. 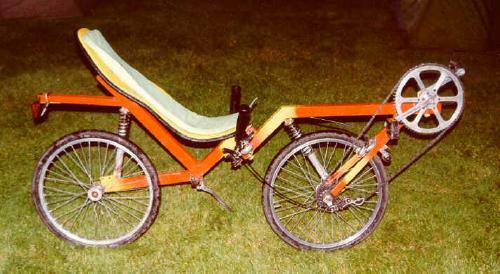 This bike is one of the very first test versions of the Flevo-Racer. There have been several experiments with different frame parts and geometries. This version has a double main frame tube. Some versions had a mudguard over the front wheel, between te two frame tubes. This is a FlevoRacer with 451 wheels. There has been built a whole series of them. 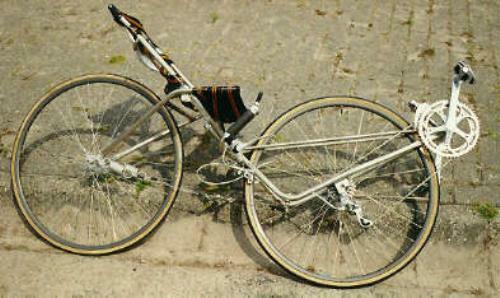 Some with single arm rear suspension (as this one) and some with a traditional fork. They are not so mini: Ymte Sijbrandij could ride on it, with his body length of almost 210 cm.